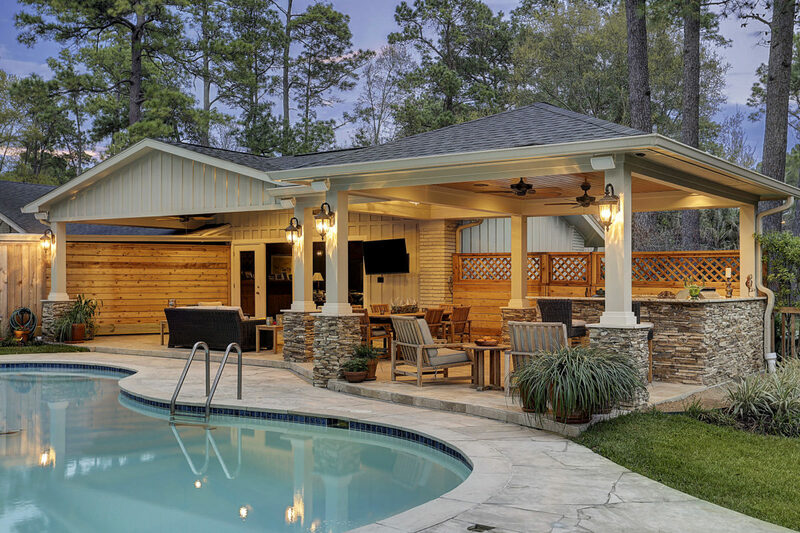 The original space of this home was a wooden deck that didn’t give the homeowner the space they desired to relax comfortably by their pool. The outdoor living space we created for them gives them all the necessities needed to spend quality time outdoors. Here is the before shot of the home. They had some major drainage issues that we corrected in the building of their new outdoor covered patio area. This part of the patio cover is dedicated for food prep and dining. The custom built fence gives the space the privacy they needed. A Kitchen with it all! This U-shaped kitchen is an outdoor dream… a dropped power burner, sink, grill, fridge and plenty of storage and counter space. The raised bar top allows for extra seating. The project has 3 separate ceiling areas – all with stained tongue and groove with painted beams to match the home. The seating area is a vaulted ceiling with dark stained beams. This covered patio is right at 600 square feet. A spacious area for entertaining and hanging out by the pool. The floor is a Versailles pattern travertine tile. Build a reason to live outdoors! We created a great space for the homeowner to enjoy. There is plenty of room to have friends and family over for an afternoon of fun or for an evening get together. Top notch company. This firm stands behind its work. We had a small issue with some cracks in our slab related to settling, and Ryan had someone out the day after my phone call. Upon inspection, we were presented with several options and the work was completed in a week. I cannot say enough good things about Texas Custom Patios and the quality of their work.